A couple of months ago, I was told a story about Meghan Markle and her tights. Or pantyhose, as I imagine the Duchess of Sussex calls them. 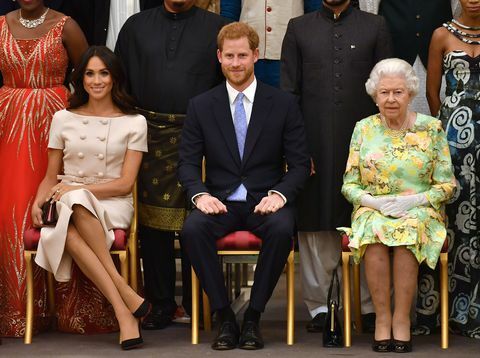 A staff member at Kensington Palace apparently suggested they buy her tights from Marks and Spencer, but Meghan insisted on getting them from the more upmarket Wolford instead. The phrase ‘garbage patch’ was said to be used in reference to M&S, but perhaps that un-duchessy phrase is exaggeration since Meghan has stepped out in a black M&S jersey before. Hmmm. When I was at Tatler, we tried to write a tongue-in-cheek piece headlined ‘How to treat the staff.’ I can’t quite remember but suspect it was full of immensely useless tips such as ‘try not to sleep with the butler’, and perhaps for this reason, and because it sounded much too grand, too Marie Antoinette, the piece didn’t run. Talking of ‘staff’ these days does sound preposterous, and yet you, esteemed Sunday Telegraph reader, might have a cleaner, or a nanny. Perhaps a gardener. I have a lovely cleaner who comes once a week to hoover up the spiders I can’t face and, when I leave the house yet again without my wallet, I often wish I had a nanny but they are too expensive. But you wouldn’t shout at a cleaner or a gardener, say about a pair of tights or a dying clematis. You wouldn’t lose your temper with them without a very exceptional reason because it isn’t 1421 and they are not a lackey. I saw this countless times while working for the magazine, cross-crossing the country from castle to castle in my important role as ‘interviewer of Dukes’. In proper households, staff are not downtrodden underlings as people imagine. They are treated like members of the family, and in some cases prized much higher than that. Think about Jeeves – Bertie Worcester might have disobeyed him by wearing a natty hat Jeeves disproved of, but Bertie would sooner have married Honoria Glossop than shouted at his valet. Of the dozens of butlers I came across – many Buckingham palace-trained – they were largely more capable than their employers but paid properly and looked after because both sides understood the other. Old nannies still often retire and are cared for by the family (as happened in Brideshead and seems to be the case in the Rees-Mogg household). My great-aunt had a cleaner called Moira who was still visiting her aged 80, by which point Moira was largely just rearranging the dust. But it was a long-standing relationship that mattered to them both. Of course it’s an easier relationship to understand for those like dukes or princes who have been brought up in castles, surrounded by staff, than for those who haven’t grown up in such a world. And I’m not saying that employers aren’t sometimes high-handed and spoiled. Prince Charles supposedly insists that his shoelaces are ironed every morning and toothpaste is squeezed on to his toothbrush for him. But as with any job, it should be a relationship of mutual respect, no shouting. And if there is shouting and tantrums, then you’re absolutely right to pack your bags and get out. On the topic of staff, I helped my mum out behind her marmalade stall at a Christmas fair in a Hampshire village hall last week (she was very good and didn’t shout at me, although my wages were naught). It was revealing. Behind a counter, a till, or even 80 jars of marmalade, you are invisible to certain people. These sorts would invariably saunter past the table, try a taster of marmalade which Mum had carefully spread on a small piece of sourdough, then curl their lip and walk on. We were sitting RIGHT there, behind the stall! Rude. I understand that shopping at stalls can be awkward and you don’t want to be inveigled to buy, but a smile still costs nothing. If you’re someone who walks around a fair tasting everything several times but not buying (bravo to the mothers with six-month babies strapped to their chests having a gay old time while pounding the rhubarb vodka), then at least be polite about it. I read recently about the ‘humanisation’ of dog food. Chow is going upmarket. Less Caesar, more caesar salad as pet-owners increasingly feed their dogs food we’d happily swallow ourselves. It’s a trend blowing over from America, the article said. In California, someone who perhaps needs more going on in his life has even developed a pumpkin spiced latte for dogs. But I think Brits got here first. A couple of years ago, I went to interview a chap who runs a super posh and exclusive holiday kennels in south Wales. Set on a 100-acre farm, the kennels have underfloor heating and speakers so classical music can be pumped through to the mutts, there’s a helipad so owners can drop their darlings off before jetting to the Bahamas and the dog food is made by Michel Roux – ostrich and cherry-flavoured biscuits, for example. I had a small bite. Not unpleasant. And Digestives can get a bit boring after a while, can’t they?